Home » OUR TOURS > » Day Trips » Three towns, three treats: SHERRY, CHEESE and SWEETS! This tour has been designed to visit and taste the wonders of three different small traditional industries in three different parts of the province of Cadiz. We will start in the little coastal town of Rota. There we will visit a local goat’s cheese factory that is a great example of self-sufficiency and excellent quality. 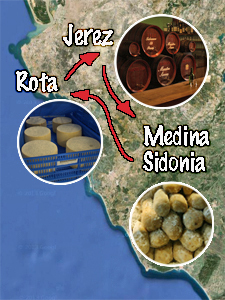 After doing the corresponding cheese tasting in Rota, we will drive to Jerez old town. There we will visit a family owned Sherry bodega specializing in Very Old Rare Sherry (VORS). We will be explained the aging process and particularities of the different Sherry varieties as well as the kind of food each wine pairs best with. This will surely open our appetite so with all this knowledge we will go for lunch to a fabulous local restaurant in Jerez serving quality local food and wine. Then, and with some room left for a bit of sweet indulgence, we will drive to the quaint little town of Medina Sidonia were we will take a short walking tour. Along our walk through the whitewashed streets of Medina, we will stop in a few ancient sweet shops selling different local specialities that we won’t be able to resist. This will complete our foodie programme for the day and then we will drive back to your accommodation. This day trip is ideal for people wishing to visit and taste the artisan produce of the traditional food and wine industries of the province of Cadiz. It includes private transportation in a modern and comfortable vehicle with A/C to and from your accommodation. Your personal guide and driver will pick you up in the morning and will drive you back in the late afternoon after spending a great day together savouring the wonders of this province. Group size: minimum 2 people, maximum 8. Prices: start at 85 Euros per person (incl. VAT) for a group of 8 people. Includes: private guide and driver throughout the day, all entrances and cheese, sherry and sweets tasting.